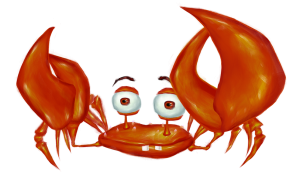 Crab Waterfall is the third Langeroo Adventures game in development. This game uses the entire Langeroo word bank, with over 350 words, to create a fun spelling game. 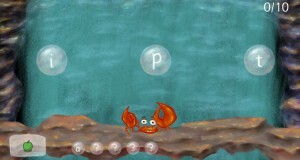 In this game, children take control of a crab who catches bubbles in order to spell out the word they can see and hear. In the screenshot here, you can see the graphic of an apple in the corner (and the child can hear the word being spoken by clicking on it), and the child needs to spell it out by catching the letters in the correct order as they fall down the waterfall. You can see that the child has already caught the letter a, so they are now trying to catch the letter p in order to progress through the word. 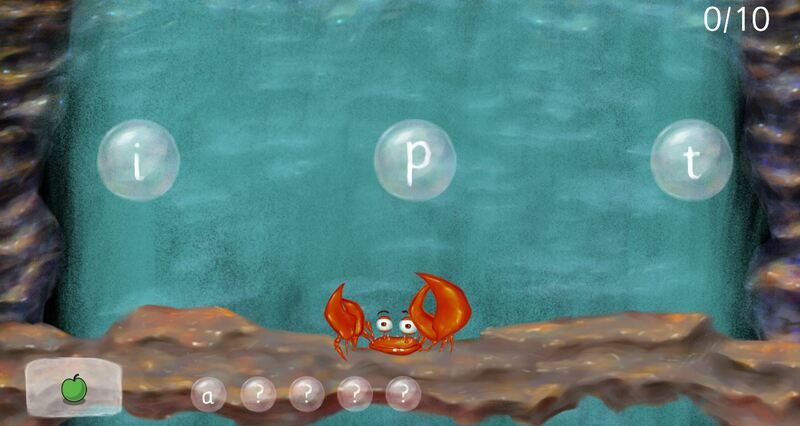 When the child catches a correct letter, the crab does a fun dance, and the correct bubble drifts down to the correct spot at the bottom of the screen. This allows the child to see their progress and work out which letter comes next. We’ve been iterating the controls on this to make it simple for the child to use. Initially we had this with free-play controls – the child could touch the left half of the screen to move him left, and the right half of the screen to move him right (similar to the way Pancake Panic works), but we’ve adapted this so the child can swipe left and right and this moves him between three positions (left, middle, and right), underneath each of three “fall” spots. We’ve found that children are used to swiping on tablet screens and being able to quickly move between positions with one or two motions keeps things simple so the child can focus on the letters rather than the controls. We will, however, keep the free-play controls in place when the game is being controlled with a games controller. As these games are geared towards young children, it’s important to us to keep the controls simple and basic, and have the game behave in a way that a child would expect. The crab himself is a lot of fun. He moves as a crab should, and pinches the letters when he catches them. He also has a fun little dance, which he does when he catches the correct letter. It’s important to us that the “reward” animations are fun and exaggerated, and something the child looks forward to seeing. We’re in the middle of constructing a “topic picker” which will work with this game, and several others in the Langeroo Adventures suite. The topic picker will allow some of our games to be played with every word in the Langeroo word bank, so the child (or parent) can pick one of our 26 topics to play the game with. This gives each game longevity as the child can progress through all 350 words at their own pace, without having to relearn gameplay mechanics.